I came across this photo on Facebook last night of my former students Brad and Itxel, in traditional Guanacaste dress, standing in front of the mural I painted of a Guanacaste man and woman in traditional dress! A few months ago several of my former students got on Facebook all of a sudden after the school was able to get a computer lab. I can’t hardly believe it…before that, only a few families in town even had a computer, never mind the internet. I painted this in 2007 when I was a Community Economic Development Advisor with the Peace Corps in Costa Rica. I lived with Brad’s grandmother’s family my first several months in La Cruz, so we saw each other often outside of school. Itxel lived down the street, and was in my English and Junior Achievement classes (and soccer games). 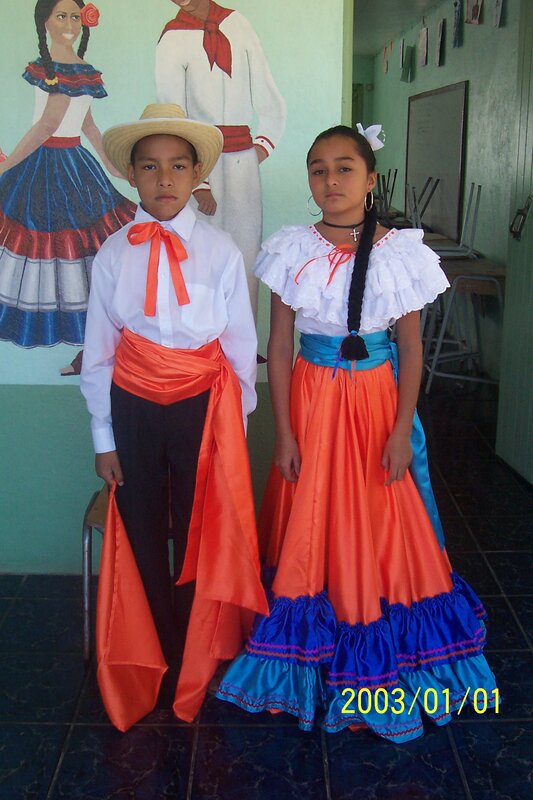 They look like they’re ready to go to a fiesta típica and dance to some marimba! Except for the mean faces. People don’t seem to smile too much in pictures in Costa Rica….in reality, these kids were smiling and laughing all the time. I think Brad is trying to imitate his grandfather Hernan, who always looks like that. The camera incorrectly dated the picture 2003, it was actually taken in 2010. Hi. I finished reading “The Catcher in the Rye” and I was looking for an image that depicted the part that for me was the most significant one in the book, and there I found your art. Beautiful, but what really surprised me was finding this photo from Costa Rica. I’m from Costa Rica and I have friends in Guanacaste so this photograph made kind of nostalgic. Back to the Catcher in the Rye: that painting is beautiful, even if its not finished yet. I’m looking forward to the final result. Pura vida mae! First of all, thank you for your compliment on the painting. I think that’s so cool that you were able to find my painting based on The Catcher in the Rye through search! What part of Costa Rica are you from? I’m also nostalgic about Guanacaste…I left there in 2008 and am looking forward to going back to visit sometime. I live in the Washington, DC area, and it’s like a completely different world here! I miss the tranquility and slow pace of Guanacaste. I’ll be following your work and I can sincerely say that I LOVED the final work on the Catcher in the Rye picture, by the way. The photo actually made me laugh as I’ve been through a couple of “phases” like that with my kids! I think that there may be a subconscious belief in all of us that the camera takes a part of our soul. When I was a kid, I felt very uncomfortable around a camera and as I got older I convinced myself that if I just excepted it and pretended to be completely relaxed, at least I’d look nice. I like photography, but it’s got a sinister quality to it, especially black&white photos from the early days, where I’m sure everyone felt uneasy while posing.